GPS Coordinates: 46.163869, 9.588409 (46°09’49.9″N 9°35’18.3″E). 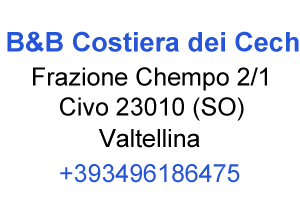 The B&B Costiera dei Cech is located 800 a.s.l. 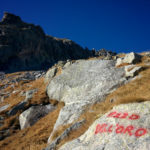 in the small hamlet of Chempo 2/1, Civo, 23010 (Sondrio) Valtellina. By car: from Lecco run SS36, it’s a bypass, to Sondrio (North) first along the lake of Lecco and then the lake of Como. Continue towards Sondrio up to where the road ends near Morbegno. Cross the town and follow the signs to the left for Costiera dei Cech. When it begins to take altitude, follow the signs for Dazio and then for Serone, Naguarido and at the end for Chempo where is the B&B (when you pass the road sign of Chempo take the first on your left, the B&B is the second house on the right). If you have some problems with your satellite navigator to find the Chempo’s hamlet, try to set Civo, hamlet Chempo or phone us when you are nearby. By train: from Milan Central the train takes 1 hour and 40 minutes to reach the station of Morbegno. Regional trains, from 06.20 a.m. to 11.00 p.m., about a train every hour, saturday, sunday and holidays including. You can find more information on the web site of Trenitalia. The station of Morbegno is also the point of departure of the buses line STPS, direct to Chempo which stops a few meters near our B&B. You can find more information about the buses on the web site STPS. You can reach us by Taxi Driver or taxi of Morbegno too. If you want to reach our B&B by train we offer you a taxi service for a fee, to and from Morbegno without time restrictions. Also, if you want we can drive you in a local restaurant/agriturismo or at the start of your trekking.